Passenger arrival records can help you determine when an ancestor arrived and the ports of departure and arrival. They can also be used to identify family and community members who arrived together as well as the country they came from. However, they’re not easy to research. It’s sometimes assumed these records will reveal exactly where in the “old country” our ancestors came from—but, it’s not always that simple. Depending on when your immigrant ancestors arrived, ship passenger lists may or may not provide this information. 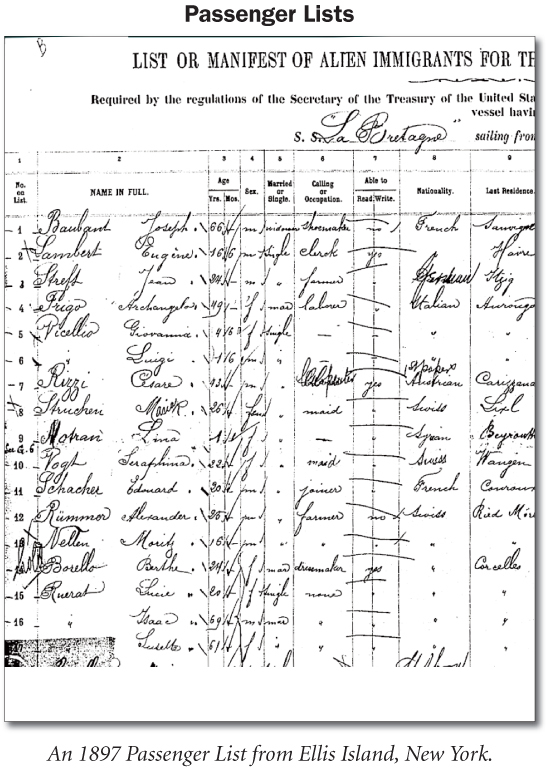 In many instances, figuring out where your ancestor emigrated from is more easily solved by tracking down naturalization papers, rather than ship passenger lists. Not all passenger lists for all ports have survived, but thousands have and are held by the National Archives. New York City was the main arrival port between 1820 and 1920, processing some 24 million immigrants. Other major ports include Baltimore (1820-1952), Boston (1848-1891 and 1902-1920), New Orleans (1853-1952), and Philadelphia (1800-1948). There are also records available for a number of smaller ports such as Portland, Maine; Providence, Rhode Island; Galveston, Texas; and San Francisco, California. • Last residence and final destination in the U.S.
To search these records you MUST have an approximate arrival date. There were hundreds of ships coming into American ports every year with thousands of persons immigrating on those ships. Check for indexes first. • If you’re lucky, your ancestor may be included in a compiled index such as P. William Filby’s Passenger and Immigration Lists, the major index for arrival records in North America from the 1600s to 1820—it’s an excellent index of over 2,500,000 names found in more than 2,500 published sources (and it’s on microfilm at the FHL). If your ancestor was among the 17 million immigrants who passed through Ellis Island and the Port of New York between 1892 and 1924, you can find his or her passenger listing here. Once you’ve identified the right record in this huge database, you can view the digitized actual manifests and an image of the ship on which your ancestor traveled.